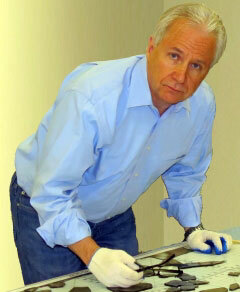 Broken glass evidence can be critical in solving crimes and reconstructing accidents. 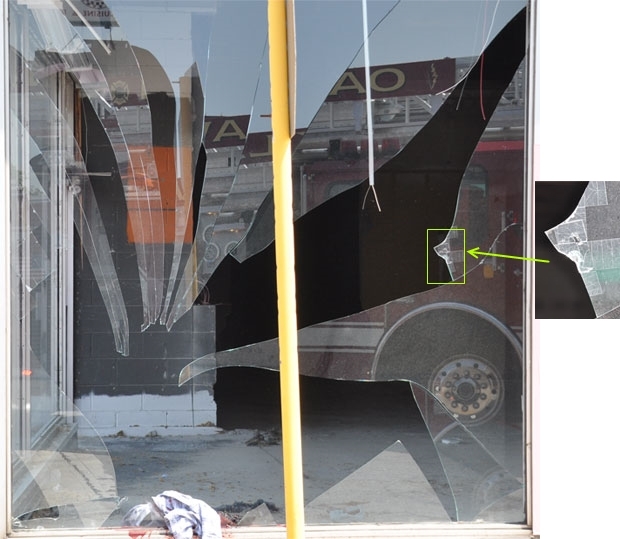 When annealed glass breaks under relatively moderate force, the largest shards that remain in the opening can be extremely dangerous to victims and first responders. Glass that remains in the frame overhead is especially hazardous because if it suddenly releases it can drop down on people below like for a razor sharp dagger. First responders should take care to avoid broken glass injuries by positioning below broken glass. Although tempered glass is designed to break into small cubes, these cubes can remain interlocked with one another long enough to cause serious broken glass injuries. In shower door injuries, for example, large clumps of heavy glass can call on a naked bather and cause far more than just superficial lacerations. Large shards of annealed glass can be razor sharp. If a victim trips over a window frame with glass shards pointing up, cuts can be deep and very dangerous. In these situations, first responders will need to act quickly to stem the bleeding or death can quickly occur. The way glass enters the human body can become evidence in many ways. The size, position, angle and shape of lacerations can be important evidence in determining the victim’s body position prior to and during the accident. Therefore careful photographs of all glass injuries from different angles are critically important. When glass is involved in a crime or an accident, law enforcement personnel should take great pains to avoid disturbing the broken glass evidence. Many high resolution photographs should be taken from both sides of the glass. Some photos should be establishing shots. These are wide angle shots that take in the entire surroundings. Other shot should be of the entire piece of glass that remains in the opening from as central of a point as impossible to reduce parallax distortion. Then close-ups should be taken sequentially around the sides of the broken glass evidence. Then careful pictures of the glass shards on the floor or ground should be taken. After shooting pictures of this glass, lay a tape measure across the shards and shoot the same shots again. 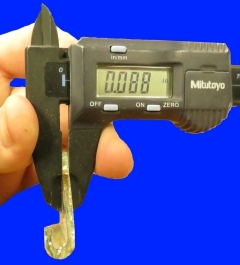 In one set, have the tip of the tape measure at the face of the glass and extend the tape straight away from the glass. This will show how far the shards traveled away from the frame, another indicator of force. Then place the tape parallel with the frame on the floor and shoot again. This will convey the dispersal of the shards and could assist in determining if the force was applied to the glass on an angle rather than “straight-on”. An astute detective took these excellent shots of broken storefront glass that gave way easily when a bicyclist pressed against it. We know the glass broke easily because the broken glass evidence included very large shards. This is a classic low energy break. The inset at right shows why the glass gave way so easily. It was already damaged prior to this fatal accident. Someone put tape on the original crack in an effort to hold the glass together. Glass that has been cracked is dangerously weakened. It can be a catastrophic accident waiting to happen. In this case the bicyclist died from his injuries. Photographically these photos show the power of an establishing shot coupled with a closeup. In any situation where responders deem evidence collection to be necessary, a few pieces of broken glass evidence should always be taken. Store the glass in labeled containers that are not too big for the specimen, so the glass won’t knock around and break further. Do not store broken glass evidence with anything fibrous such as cloth or paper towels. Glass is made by floating molten powders over a molten pool of tin. 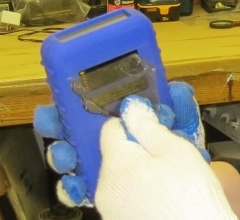 A trace amount of tin remains in one side of the glass and can be detected with a tin side detector. Matching the tin sides of broken shards can be useful in a forensic reconstruction of broken glass evidence. If blood is on the glass, it should definitely be collected as evidence after first air-drying the blood. If the crime or accident involved loss of life, serious injury or felony, consideration should be given to carefully collecting all of the broken glass evidence that remains in the frame with as little disruption as possible as well as the glass on the floor and other surfaces. To collect evidence glass that still remains in a window frame, stabilize the glass by applying 2″ wide clear packing tape to one side only of the pieces still in place. For large areas, 24″ wide clear carpet protection rolls can be used. Once taped, mark the tape with date and time. Place arrows indicating up and down, and write on the inside surface, “inside”. After marking the broken glass evidence, take pictures of the glass while it is still in the frame with the labels clearly visible and in the context of the surroundings. Once the glass is stabilized, call a glazing contractor to carefully remove the glass and make sure they tape the edges once the glass is removed. Cut a piece of plywood to the same size as the glass and tape the broken glass evidence to the plywood. The evidence is now secured and ready for storage. Glass breakage can sometimes be so explosive that tiny shards can embed themselves in the clothing of people nearby. If a crime occurs and broken glass was involved, the perpetrator may have evidence glass in his or her clothing. After 24 hours, most of this evidence will be lost. So it is important to carefully check the clothing of suspects for glass embedded in their clothing. A good lab will match the glass from the suspect’s clothing with glass taken from the scene based on color, composition, refractive index and density. Here’s an example: Intruder breaks into house on Main Street. 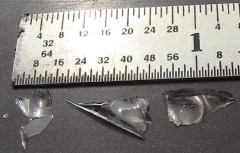 Glass evidence used in the arrest. Was the glass strong enough? Some crimes and accidents involve someone crashing through a pane of window glass. Did the glass play its part in preventing this occurrence? Was the glass sufficiently strong for the window it was glazed into? Some glass is required to be safety glass, which is either stronger because it is tempered or laminated. If the glass was not safety glass and it should have been, the building owner may have liability. Even if safety glass is not required, the glass should be strong enough to resist wind loads. If it is too thin and weak, an injured party may have recourse against the building owner. Handled properly and understood well, glass may be the conclusive evidence that closes the case! 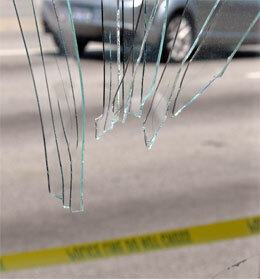 ANSWER to the challenge posed in the caption of picture of multiple glass impacts: The top impact occurred first. Primary cracks from the impact extend to all glass edges. When the second impact occurred, there was already a vertical primary crack near it. As soon as the primary cracks from impact #2 reached that vertical crack, they stopped. Remember when I said that primary cracks tend to extend to the edge of the glass in order to release all of the impact energy? The cracks from the second impact did exactly that. They stopped at the new glass edge that was created by a primary crack from the first impact. Write a comment and let me know how you did. California, New York, New Jersey, Florida, Georgia.